Lab grown oval diamond antique-style drop earrings featuring a five-stone drop. Each pair of Ada Diamonds earrings is custom made to order. Available options: platinum, 14k or 18k gold: white, yellow, rose. Our custom design process offers sophisticated guidance and curation from an approachable diamond expert. Free shipping and 30 day returns. Ada Diamonds Design Description- A regal and remarkable pair of drop earrings featuring oval brilliant lab grown diamonds centered in an elegant, antique style and suspended by a five stone drop. Available in a 14k white, yellow or rose gold setting. Starting at pricing for earrings assumes a matched pair of GH, VS2/SI1 oval brilliant lab grown diamonds with GH, VS lab grown diamonds set in 18kt white, yellow, or rose gold. Additional setting fees for 18kt: $150, platinum $300. All of Ada's fashion jewelry is fully bespoke and made to order. Our friendly Diamond Concierge are here to assist you in creating a stunning piece of fine jewelry customized to meet your need with conflict-free lab diamonds hand selected for quality, fire, and brilliance. Inquire to get started or learn more about our exclusive Concierge Experience. In a hurry? Shop our hand-curated selection of ready to ship lab diamond fine jewelry or inquire to build something custom. To get started, hit the "INQUIRE" button. We're here to answer any question you may have! Your Concierge will promptly send a curated list of diamonds to match your interests and budget. 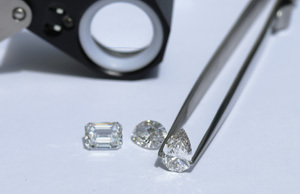 Once you've narrowed your search, we'll provide HD media and inspect your diamond(s) for quality. Adjust your design until you are completely satisfied through CAD models and renderings. Production typically takes 2-3 weeks. We offer a full 30-day return policy to ensure your satisfaction. Ready to Begin Your Concierge Experience? The more information you provide, the better we can serve you. Please include details such as diamond shape, carat weight, metal type, budget, and timeline.